ČEZ Group focusing on development phases in German wind energy projects. In December 2018 the ČEZ Group acquired wind turbine projects in Germany with a total potential installed capacity of 190 MW. “In view of the climate objectives recently approved by the European Parliament, it is estimated that in the forthcoming period the European renewables market should expand by 10 GW of installed capacity per year. Half of this volume should be created in Germany and France. We want to take advantage of our reputation and experience on European markets, particularly in development-phase projects. 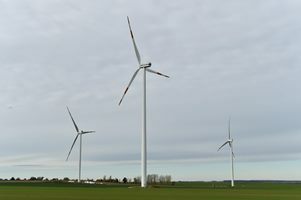 Our already functioning wind turbines in Germany currently generate more than 300 GWh of electricity per year, which covers the consumption of more than 100,000 households,” said New Energy and Distribution Division Director Tomáš Pleskač. The ČEZ Group currently operates 53 wind power plants in Germany with a total installed capacity of 135 MW. This came about in cooperation with well-known local developers. These projects will compete in the system of German auctions in 2020–2022. “After last year’s entry into development in France, we are now prepared to make use of the ČEZ Group’s expertise in developing wind farms in Germany. Through a combination of buying power, available finance and experience in operating wind farms, we can achieve interesting returns on investment in this highly competitive market. Cooperation with local partners helps in resolving the local specifics of development. Both partners are leaders in development in Germany and in the area of renewables in general,” said ČEZ Director of Renewables Martin Pacovský. In the long term, Germany is the Czech Republic’s number one business partner. Last year, 32.8% of our exports went to our western neighbour, and imports constituted 25.8%. The situation on the energy market is similar. In 2017, more than 9 TWh of electricity flowed across the border into the Czech Republic, and 5.5 TWh flowed in the opposite direction. In view of the long-term stability of conditions in the investor environment, the established system of auction mechanisms for competitively determining support levels and the overall maturity of the market, Germany represents a guaranteed return on investment in projects. Operating on the German OZE market is also an advantage in terms of passing on the experience in how the auction system functions, whose model could also be introduced in the Czech Republic. ...the ČEZ group operates wind farms in Europe with a total installed capacity exceeding 700 MW? ...because of new acquisitions, approximately 70% of the ČEZ portfolio in wind power plants in Europe is currently in the development stage? ...in addition to the German market, ČEZ is also looking at opportunities in renewables in other European countries with the aim of building up a stable portfolio of assets in various phases of the life cycle as well as providing associated services? ...the ČEZ Group has also made acquisitions in new technologies in Germany? So far, it has made four investments through its investment fund INVEN CAPITAL in companies operating in new and decentralised power generation (Sonnen, Sunfire, tado° and Cloud&Heat Technologies) ?